The genus Brassia comprises about twenty species, all of them native to tropical America; most grow in forest country at altitudes below 1500 m. In 1813 Robert Brown named the genus after William Brass, an English botanist who collected plants in Guinea and South Africa in the 18th century. Commonly known as spider orchids, Brassia species are characterised by their long, narrow, tapering sepals and petals. In nature female wasps pollinate the flowers. 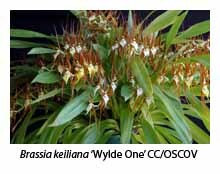 The most common species in cultivation is Brassia verrucosa, which grows in cloud forest between Mexico and Nicaragua at elevations of 900-2400 m. Its inflorescences bear yellowy green flowers marked with chocolate brown spots and blotches. The flowers are evenly spaced in two parallel rows, and measure up to 150 mm from top to bottom. The pale yellow lip carries a number of green warts, hence the species epithet verrucosa, which means warty. 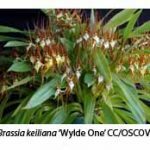 Although some Victorians grow and successfully flower this species under shade-house conditions, in my experience its plants are much more sturdy, and provide more and larger flowers if grown in a heated glasshouse at a minimum temperature of 10°C or above. A very similar species, believed by some to be synonymous with B. verrucosa, is B. brachiata, which has larger but fewer flowers than B. verrucosa. Its flowers are said to measure between 150 and 200 mm across (see Jay Phal’s website at www.orchidspecies.com for a good description and picture of this and other brassia species). 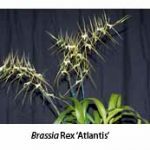 For several years I grew another species under the name Brassia keiliana before I learnt that it, and about a dozen other species, had been transferred to the formerly small genus Ada. Its flowers have narrow, pointed, orange-brown sepals and petals and are considerably smaller than the above species. 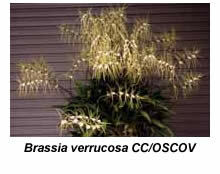 They open much more widely than the tubular flowers of the well-known Ada aurantiaca. For many years I grew another species, Brassia gireoudiana, which is said to carry extremely large flowers measuring more than 300 mm from tip to tip. Although I moved the plant to various spots in my glasshouse (cooler, warmer, brighter, shadier), it steadfastly refused to flower. Despite my warning, it was purchased by a friend several years ago. No doubt he hoped to tease me with the flowering plant in a year or two but I’m pleased to say that event hasn’t yet occurred! 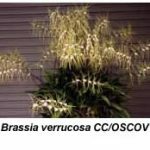 Finally we arrive at the main subject of this article, the King of the Brassias, which accurately describes the primary hybrid between B. verrucosa and B. gireoudiana, registered as Brassia Rex. The late Goodale Moir of Hawaii first made this hybrid in 1964. I acquired a plant at least ten years ago, and eventually flowered it in December 2005. Its flowers are enormous, the dorsal sepals averaging 160 mm in length and the lateral sepals 250 mm, a total of 410 mm when measured from tip to tip. Laid sideways on this book, the largest flower would extend beyond the limits of this and its facing page! There were eight flowers on the inflorescence, each sepal and petal being deep yellow with dark brown spots and blotches, while the lip was a lighter yellow but similarly spotted. 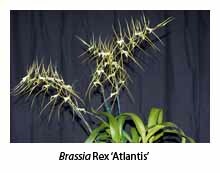 Although my plant of Brassia Rex carried three new growths in 2005, only one of them produced an inflorescence. Obviously this hybrid needs to be grown into a large plant before it is willing to flower. However, it was well worth the long wait, and I thank my lucky stars that I didn’t give up in disgust, as I did in the case of its parent B. gireoudiana).